Go see the Black KD-7000. Or, we also have the "Baker's Secret" version of the KD-7000... the KD-8000. Go see the Silver KD-8000. Considering the KD's innovative features, other scales don't match up! Platform Size 6.8" x 6.8"
Scale Size 9.8" x 8" x 3.8"
Protective "Gunk" Shield The KD comes with a removable gunk shield to protect the display and keys from any concoction you might be mixing up. This is perfect if ya plan to use the 7000 as a candle making or soap making scale. Programmable Auto-Off Feature If you've ever had your scale turn off on ya in the middle of important measurements, you'll realize what a blessing this feature is. You can program the 7000 to turn off automatically, or to stay on until you turn it off yourself. Bright Backlit Display This table top kitchen scale has a fancy backlit display to help ya see your weight readings, even in dim lighting. Not only that! This digital scale's display will tell ya if it's holding a weight, if ya pressed the tare button, and the unit you're weighing with. Tare Feature The tare button on the front of this digital food scale can be pressed to "zero out" the weight on the scale. You can then add more weight, and the display will only show the weight of the item you're adding. This sure is useful if ya want to use a separate bowl for mixing up your ingredients. 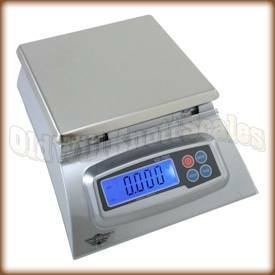 Stainless Steel Platform This digital food scale has an easy to clean, stainless steel weighing platform. The good thing about stainless steel is, unlike gold or silver, it doesn't scratch easily and keeps its shine without rusting or tarnishing. It Remembers The Last Unit Ya Used If your application needs weights in the same unit of measurement, (like ounces for instance), it can be a real pain if your scale always turns on ready to weigh in grams. It's a good thing the KD 7000 turns on displaying the unit of measurement you were using when ya turned it off. I've had this scale for 4 years and absolutely love it. The best scale I have found for soapmaking. I purchased an adapter with it. I occasionally teach soapmaking to friends and always recommend this scale to them. The scale was exactly what I wanted and some day I might want to order the adapter for AC, but not right now. The scale was shipped quickly, boxed up nicely and seems to function just as it should. The quality of the scale seems quite good for the price and it has a 30 year warranty... I'll be pretty old by then! I bought this scale in 2012 and it is now 2018! I have not had one issue with the 7000. The calibration is still spot on. I use 2 of these scales in my business and they are used 8+ hours a day without any problems. One runs and runs on batteries alone (since there is not outlet close by), typically get 9 months of use before changing batteries. I bought another one for home use because it has been so reliable and accurate. I like the large platform, and hold & mode features. I have bought at least 6 scales from Old Will Knotts and have been very pleased with them as well. I already have this scale for soap. When I decided to make lotions, I wanted an additional scale. This one works just as well as the old scale. 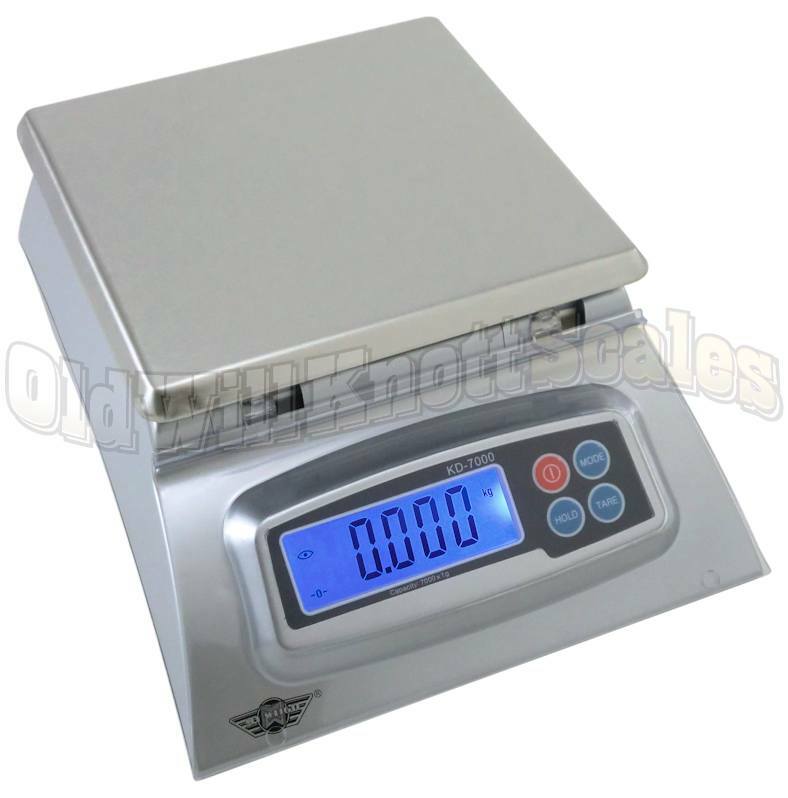 I think these scales are easy to use and the different modes of weighing are just perfect. I ordered the adapter and would recommend this as well. As this being my first experience in purchasing and using a small accurate scale, I have no history to compare it to, but I can say that I have been very pleased with the service I received from Old Will Knott Scales, and the model My Weigh KD 7000 scale I purchased is working like a charm for what I use it for. I use the scale to measure out 2-part liquid silicone and resins to make molds and castings. I often use small amounts of resin which makes accuracy in measuring out parts A & B highly critical, and the accuracy of this KD 7000 scale seems to be just the ticket. I would not hesitate to buy from Old Will Knott Scales again in the future, or recommend the company to a friend. Scale is working out great. Found that the calibration was off slightly, it showed a weight of 4995g with a calibrated 5000g weight. After calibration, the scale has consistently showed a zero error when retested with the calibration weight over a several day period. This scale is everything I wanted and needed for my soaping addiction :) All other scales I have purchased were basic kitchen scales and quickly began to wear out. I have gone through 3 scales in 2 years. I LOVE THIS SCALE! It is durable, extremely accurate, and I am happy that the tray comes off easily for storage (it is usually the tray that breaks on the cheaper scales). The scale is perfect...and has met my expectations. The delivery was on schedule. We use these scales to weigh our birds on. They are reliable and durable, take being outside in all types of weather, and we love the 20 year warranty! Definitely recommend them for any job. I consider my self extremely lucky when I accidentally came across this product. I couldn't believe the quality! It well exceeds my expectations beyond belief! Thank you also for the super fast service. I previously owned a KD8000 scale which unfortunately disappeared during a move from Illinois to Ohio. I was looking to replace it and saw this scale (KD7000) which was identical to the KD8000 except it didn't do Baker's Math (a method to scale baking recipes). Even though I use it primarily for baking bread, I didn't use the Baker's math feature enough to justify the $10.00 price difference. The scale is extremely easy to use and very accurate. I switch between grams and ounces a lot and it just takes a push of a button even with items on the scale. I also use the tare feature (again just a push of a button) when adding flour, water, yeast and add-ins to make a dough. The platen is large enough and with no lips allows the use of almost any flat bottomed bowl for measuring ingredients. Recently, I have begun using the scale for measuring portioning items for meals. Here the switching between ounces and grams is really convenient. Also having ounces accurate to two decimal places helps with portioning. All in all, a great scale at a great price. I use the scale to count calories. The tare function makes it easy to add items to a pot with no hassle and know exactly how many grams/calories are going in. Of course, you have to know the calories per gram for each food item. But, with a calorie per gram list on hand (and a calculator if your lousy at math as I am) it's a breeze. I love this scale. I have never had digital scale before and this scale is so nice. It is perfect for my needs. I have started a weight loss program and love that I can weigh my portions. I think anyone considering this scale would be happy with it. And Old Will Knott's website it easy to use and the scale arrived in a timely manner and unscathed. Just yesterday, I recommended this site to someone who was considering purchasing a scale. This scale was highly recommended for soap making by almost everyone. Although I do have a kitchen scale, I wanted one dedicated to this new craft. This scale perfect for it! It's larger than I expected but that's a good thing. I can weigh everything in one big pot, just clear it between each, or use different containers for each...whatever works best at the time. The shield over the front is a bit unwieldy but easy to get used to. Or it can be removed completely and the supplied control covers used. So far I've found the scale to be very accurate. I would urge anyone making soap to add this one to your equipment list! The first one I received was DOA.The second scale works well and is nice appearing. The folks at Old Will Knott Scales service were awesome. Two days after my call I had a replacement scale. Relationships are established when things go wrong. Well OWKS immediately solved the problem and we now have a great relationship! As a soaper, this scale is everything! I can't believe I got by for so long without it. Treat yourself and your hobby or business to this small wonder. Had my new scale for about a month. Please with the product thus far. Had a few issues where it did not give me the same weight of the same item numerous times to check accuracy...after a few minutes of being plugged in, all is now normal. Nice scale, have ordered two! I bought this scale because I wanted to upgrade and I heard so many good things about it from other soap makers in my online groups. I like it so much that I'll be buying another one to give my son, who is in culinary school. I also purchased the adapter because I was tired of replacing batteries in my old scale. great scale. i use it for making hand crafted lotions, creams, lip balms, etc. just what i needed. and great customer service. thanks. Great scale for a soapmaker! I had looked at and dreamed about this scale for years, and I finally own it! What's great about it? The multiple weighing modes are perfect for all my needs. The a/c adapter option ensures I won't have to worry about batteries dying in the middle of a batch of soap, lotion or whatever. The large weighing platform leaves me plenty of space to work with even my largest measuring cups. The hold button is fabulous for when I run out of something mid-measure (and have to bust into another jug, bottle, etc.) or when I'm weighing packages for shipment. My only complaint about this scale is, it doesn't measure a gram from zero. In other words, I was making a small batch of a product and needed a gram of an ingredient. It was impossible to do. Customer service was great, and we discovered it's a personality quirk of the scale. To get around it, place your measuring container on the scale, but don't tare it before adding your ingredient. I love the scale. I love the price. The customer service was excellent, and prompt. The packaging was very earth friendly too. Thank you so much! This scale is a workhorse! I use it in my Ginger's Garden soap making business and it performs like a champ! I was able to find instructions on how to disable the auto-off feature, since I make bigger batches and need to tare in between. This is my second KD7000 as I have dedicated the first one to making other skin and body care products. I have the AC adapter, so I don't have to worry about batteries. I'm giving this scale 5 stars! This is a good little scale for the money. Not sure I would reorder it for making soap though. I was using a very pricey scale (which finally died after 14 years) that measured to .000 for ounces and was extremely accurate. This one only measures to .00 for ounces and the second number skips from .00 to .05 etc. That's such a small amount, it's insignificant for making soap so I can live with it. Not sure I'll be able to use this scale for making lotions etc. which require exact measuring and the gram resolution is only to .0. The only other thing I don't like is that it cuts off after 2 minutes, even when plugged into an electrical outlet. The manual gives instructions for programming the scale to stay on for 5 minutes but I can't get that to work. Other than that, it's a very nice scale -- especially for the money. I really like this set of scales for weighing out my oils and such for making soap. I can weihg more at a time with this set than I could with the set I purchased from another company. I like the panel protector, just wipe it off. I really like the adapter, no more batteries to worry about going out in the middle of weighing. To sum it up, I love my new scales. I want to say how much I love this new scale. I had two other scales I purchased locally that worked okay, but didn't offer the features that this one does. I also have to say how awesome their customer service is. The original scale I received was not weighing properly so I called customer service. They were extremely helpful and had a new scale to me within a week. I would definitely recommend this company to anyone needing a quality scale. I use my scales to weigh oils and such for making soap. I have previously bought 2 cheap scales from our local walmart in the past year. They were cheaply made and could not hold up to eery day use. My KD7000 scale is perfect! I love it! Searched for a home scale to use in my baking hobby. The KD-7000 (on sale from Old Will Knott Scales) seemed to fit the bill for weight limits, functions, and budget. It was promptly shipped and was exactly as described. 100% satisfied customer! I got this scale for soap making. It's a great scale. Measures in oz., grams, lbs. I've used it for a few months now; compact, light, sturdy, accurate, easy to use & store and I love it. I would order another one if I needed 2. But, what I found to be the most impressive was the AMAZING customer service of this company. 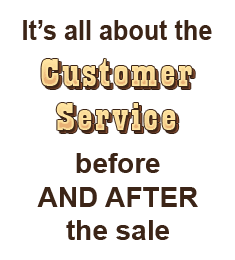 In today's profit-1st-people-2nd-corp. world finding a company that still has that home-town integrity, is genuinely friendly and cares about their customer's satisfaction 1st is a rarity anymore. Thank you for the great scale but more than that, for going above & beyond and actually caring about customer satisfaction. I couldn't be happier with my purchase or my shopping experience. Will definitely be back! So far I love my new scale. I like the size of the platform - you can put a container on it and still see the weight screen. And,the cover over the buttons, such a good idea! We use these scales on a production line for clay hot/cold packs. Over the course of a year they take abuse - nearly a million packs get plopped down on them to check weigh our product. These scales consistently stay calibrated for over a year, before regrettably, we have to replace them. We always buy another set and they still work great! This scale is SO much fun! I love using it. It's also very stylish. I started the latest edition of the DASH diet, "The DASH Diet, Weight Loss Solution" and bought this scale to help me. It is helping me succeed. It is so easy and I absolutely love the "tare" function. I had set up my new balance, and my husband, a research engineer, came over and looked at it and asked, "What brand is it?" I said, I don't know, but it does what I want it to do. He said, "I would have bought Ohaus." At that point, I went to my computer and found that something similar cost from $450 to $1600!! I have used scientific instruments during my science teaching career, and I am thoroughly pleased with the ease of use and accuracy of this model, and I especially love the price since it came out of my pocketbook!!! Just think how much money I saved! I had been looking for some scales that would be useful for home-brewing. After a short search, I found Old Will Knot. Not only are these scales what I was looking for, but the 30-year warranty is unheard of. I ordered a set, and the quality is very good and the features are very good as well. Looking forward to several years of service. Great service! Thanks Old Will Knott. I've had the scale for a few weeks and have used it daily in the kitchen. The only thing I would say is if you're looking for a more sensitive measurement below 1gram, this isn't the scale for you. I use the scale to weigh out lead to put in my RC airplanes to balance them in addition to weigh out portions for her diet. I also use it to weigh the total weight of smaller RC airplanes. It has come in very handy and I like the two digit accuracy in the ounce mode. Easy and intuitive to use. The plastic weigh table (covered in metal) is easy to clean. I suggest that the company?s package designer incorporate a place in the insulation container to store the batteries and extra clear plastic key board covers when the scale is being stored. The plastic tab use on the batteries when shipped, be changed to an easy to see color rather than clear. I am glad I got it and if this is the type of scale you need, I fully and hardy recommend it. I've owned one of these scales for several years. The 7000 gram range (over 15 pounds!) allows all sorts of direct measurements without using a collection of containers to measure piece-meal. I recently bought a second scale for our winter home. I use the scale exclusively in the kitchen, for making our daily coffee, making bread, and various tasks. I made up an ingredients spreadsheet listing weights of ingredients that are difficult or messy to measure, such as molasses, mustard, flour, peanut butter, oil, etc. With this list and this scale, baking or creating technical things with lots of ingredients such as sauces or sausage spices is very repeatable. Things comes out the same every time, and the scale allows for making minor ingredient changes: "a little to sweet?" use 20 grams less sweetener next time, etc. Over time, you can develop recipes that are constant and reliable. If the folks at Old Will Knott Scales sold used cars and washing machines, I would not hesitate to buy from them. They have a very personal approach to selling. Even though it is a '.com' store, it just feels right! I spent an hour in a store trying to figure out if their digital scales did what I needed them to do. I came home, found the Old Will Knott Scales website, and in five minutes found exactly what I needed. The price was great, it arrived very quickly, and it is easy to use. I just started making soap as a hobby, and this scale is helping me turn out successful batches time after time. Love, love my new scale!! I rec'd my scale as stated! Just take it out of the box and start using. It will pay for itself over and over!!! This machine is easy to read and like that it has a back light. It has a coating to protect itself from all the goop that could fall onto it. I made a few batches of soap and it was really hard to get the correct measurements. Soooo glad I ordered this scale! Thanks for such a great machine! Very bright and easy to read display. Scale is quick, simple, and accurate, and the price is right--what more could you ask for? The accuracy of this scale is generally +/- 1 gram from 0 to 1000 grams. Above this the accuracy is +/- 1 gram plus +/- 0.1%, which makes it parallel to laboratory grade, which is scarcely believable ... given the exceptionally low price. Many other scales do not make this grade and cost much more! This is my third purchase of this item. Great performance and cheap enough to buy extras instead of moving around. I also gave one as a gift. Highly recommended. Thank You for a product that works great right out of the box! Easy to use and works just like the description on the Website! This is a company that you can trust! And I will use again! Can these scales be used to weigh produce to sale?